Touch1st SL is a young company established in Barcelona in October 2009 aiming at the development and exploitation of new technologies applied to sports. We want to tap the huge opportunities existing in the sport business by integrating our deep knowledge in the sport market and our wide experience in technology. Touch1st first released product is Socceralia, a playable soccer community. In Socceralia, users can create post, comments and vote for up-to-the-minute soccer related content in a joyful and addictive manner. Game dynamics applied intelligently to our community allow users to win points of prestige, awards and increase their profile levels. View their own and other user's progression. Check out the users they are following and what users are following them. Showcase the awards (pins, badges, trophies) they have won. Analyze their personal statistics in order to help them achieve a higher level in the game ladder. Bring news from online media. Create they own post from scratch. Launch surveys to the rest of the users. Engage players into challenges or questions. 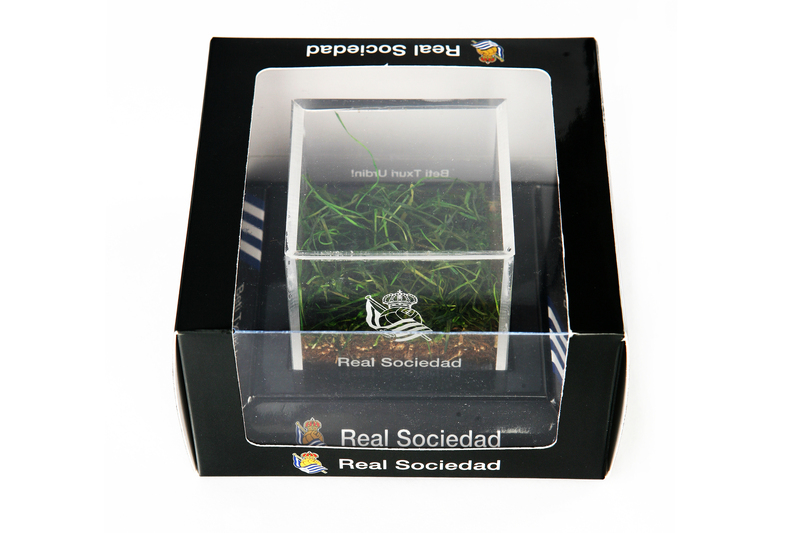 Socceralia users decide themselves what content is good and what content is not by means of kicking and commenting on other users' posts and blowing for faults. This way not only do they promote content, but also they earn points of prestige that help them increase their profile level. Users that support the same team gather together in their club's channel. This is the place where they share their passion for their own team. Also, users can visit and post in other club's channels, both national and international. This way they promote both their own team internationally and learn from other club supporters. Users supporting the same team can collaborate together to rocket their club to the highest position in Socceralia's club hall of fame. We have produced this short video to showcase the cutting-edge technology used to built up Socceralia. Our main technology components are Microsoft Silverlight and Windows Azure. Silverlight allows for a more attractive and interactive user experience. It easily enables for features such as: Drag & drop objects, Enlarge pictures, Customizing the navigation bar and the best is that the user receives a fast visual response after every single of these actions. We have placed the whole solution in the Microsoft cloud, Windows Azure, as we required a way to easily manage all the peaks in traffic we were going to have and as we wanted to have peace of mind in terms of scalability. We also required Socceralia to run fast. To do so, we had to use caché management and Microsoft just launched a very good tool in its cloud called APP fabric that does exactly this quite nicely. In terms of development tools. We are using Expression Blend. Everything the user sees in client layer has been developed using it. Since Socceralia is entirely built up in Silverylight, then Expression Blend allowed for a very efficient working process, as anything the designer was doing with it could be easily implemented by the programmers in Visual Studio. Actually, we only have one single designer using Expression Blend while at some stages of the project there were 8 programmers. So, in terms of working process 1 guy was giving work to 8 other guys. 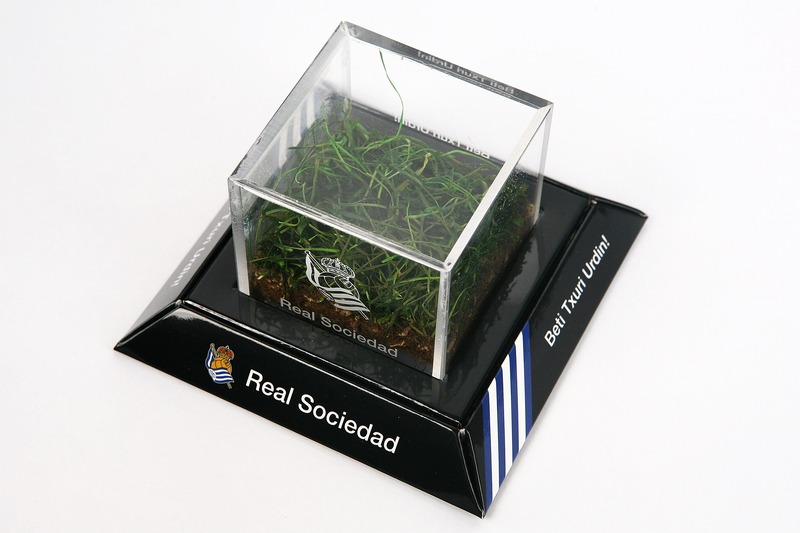 First cases with sod of Real Sociedad – In production!! 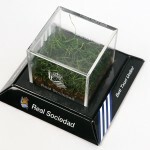 Touch1st has started the production of the first cases from Football Club Real Sociedad, a Spanish first division club, in February 2012. 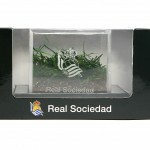 Cases will be sold in the physical an online shop of the club. 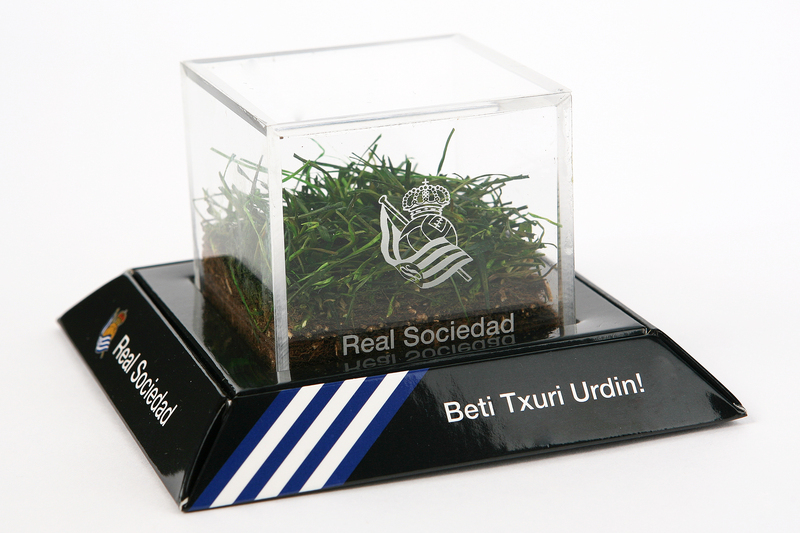 During the past months, we have closed all agreements with all the suppliers required for producing the sod in cases, including the conclusion of the I+D effort for developing the chemical process in order to preserve the sod within the case. 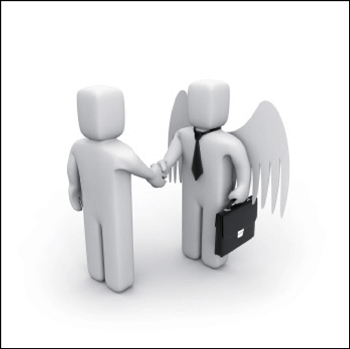 Touch1st is developing an exciting new business line. It is a consumer product full of history and emotion. 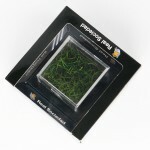 The product consist of genuine soccer field sod within a small transparent case for decoration purposes. It is the very sod players step during matches. 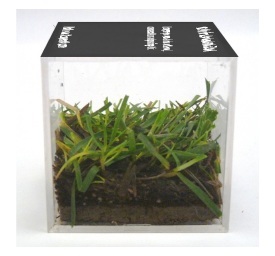 Sod is treated to guarantee its preservation. 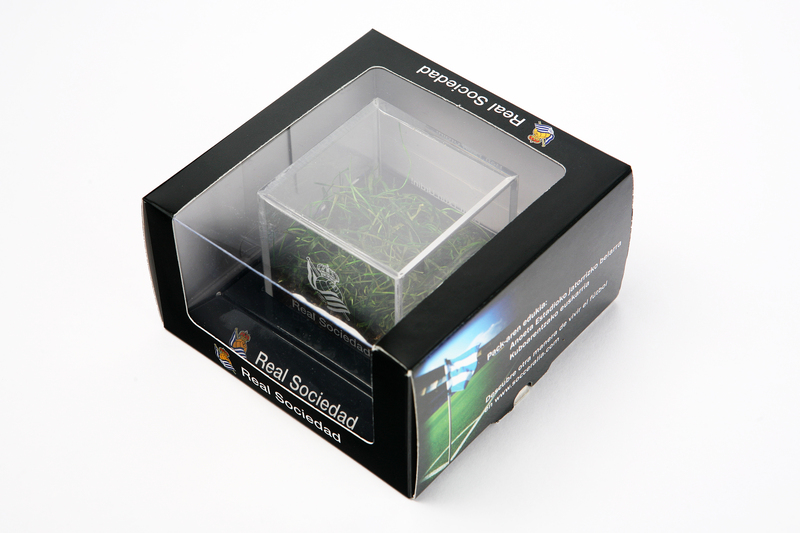 All soccer fans that we have showed it to simply love it and want to buy one. 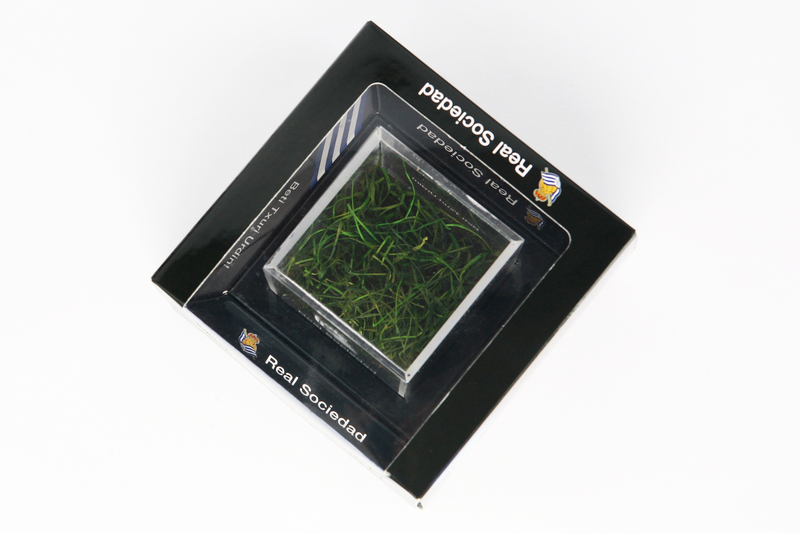 We already have agreements with various 1st division football clubs to commercialize their grass. Soccer clubs marketing departments directors believe that, because of its uniqueness and high content of emotion, this could be a product that sells similar to their shirts. The biggest soccer clubs in the world sell, individually, between 1M to 1.5M shirts every season. 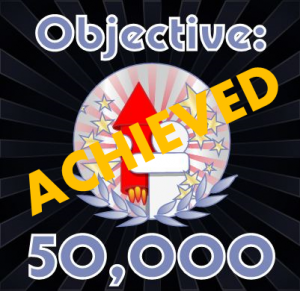 Socceralia has reached the milestone of 50,000 users in the month of August, exceding the estimatated figure for that month. 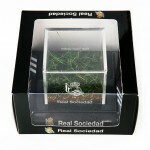 Socceralia is Touch1st first online product. It is an innovative world-wide social network for soccer fans. 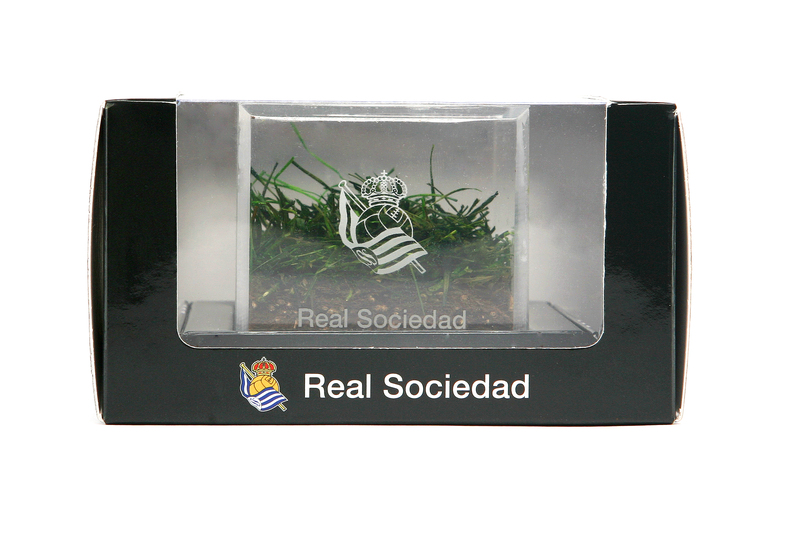 It is a user-generated soccer content publisher, enriched with social and on-line game dynamics. The company has received the support of both public and private funding raising so far 464,000€. The product roadmap for the following months includes lauching the mobile version and the eCommerce platform. 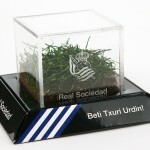 It is estimated than more than 1 million users will be enjoying Socceralia in a year and a half. 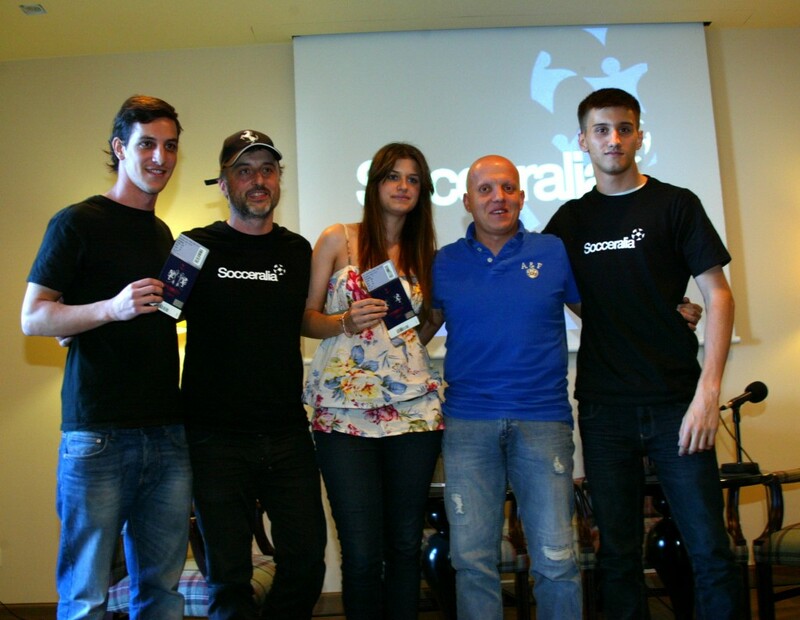 Last Tuesday 24th of May, Touch1st hold its first off-line event in Gran Hotel La Florida in Barcelona, the Award Ceremony for the Socceralia contest of two tickets to the Champions League Final in Wembley Stadium among its social network users. The winners, Carlos Henao and Clara Pariente, and the rest of users that were invited could participate in an interesting discussion with Marcos Lopez that had him sharing the beginning of his professional career as an independent soccer journalist and his vision on Spanish soccer journalism. Touch1st was selected among more than 200 hundred companies from Barcelona to travel to Silicon Valley with the “Barcelona-Silicon Valley Technology Bridge” organized by the “Chamber of Commerce of Barcelona” and BarcelonActiva, the start-up incubator where Touch1st is located. Touch1st executive team spent more than one week attending various meetings and events along with other 13 high-profile Barcelona companies. Touch1st has signed an increase in capital with two business angels for a total amount of 200.000€ during this month of February. This represents a new achievement in our business plan and perfectly complements the public financial support we received from ACC10 last year. This new milestone allows us to continue working in our ambitious product and services roadmap as well as confirms Touch1st as a solid, innovative and attractive target company for investors. We are travelling to Silicon Valley! Touch1st has been selected, along with other 13 companies settled in Barcelona, to participate in the “Pont Tecnológic amb Silicon Valley 2011” that takes place in Silicon Valley from the 27th of March to the 3rd of April and it is organized by the Barcelona Chamber of Commerce and Barcelona Activa, the business incubator where Touch1st has its offices. This technology bridge facilitates one-to-one access to a wide array of potential technology partners and financial investors located in the area of Silicon Valley. Thanks to the public financial support we have received during last year, we are glad to announce that we have extended the current facilities we hold in Barcelona Activa with a new office space in order to allocate our growing working force. Currently, our facilities account for 60m2, twice as much as we had before the extension. This allows us to get into the office both the 16 employees we have on staff as well as the Pasiona consultants we are hiring. Socceralia is a registered trademark of ©Touch1st 2011.